After the World’s Shortest St. Patricks Parade the Tater Team had a meet-and-greet at the Hot Springs visitor center. Spec-taters from the parade came to meet the Tater Team and to congratulate Spudnick for making the tight turn onto the short parade route! The truck was a very a-peeling sight and visitors stopped by to see if our tremendous tater was in fact “real”. 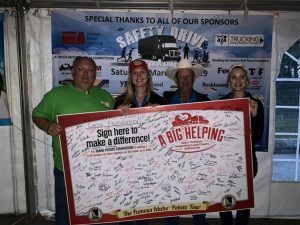 We also partnered up with the Garland County Habitat for Humanity and helped them raise money with A Big Helping signature board. The Hot Spring community really came together and there was a constant flow of people signing the signature board. The Big Helping board was covered in signatures by the end of the day! We had a great time and meeting fans and partnering with Habitat for Humanity! After our time in Hot Springs, AK we trucked back to Georgia for our next event. Tater Twin, Jessica signing the board for Habitats for Humanity! 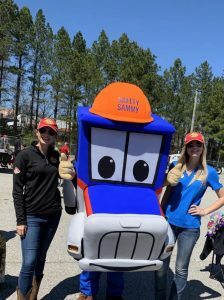 This past weekend we participated in the 7th Annual Safety Drive for a Cure in Ellenwood, GA where truck drivers from across the nation competed for first place and raised money for the Pediatric Brain Tumor Foundation! 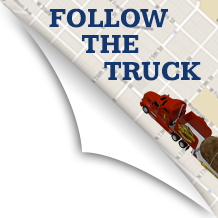 Ron, The Tater Toter, told the team about this trucking competition because he used to compete in it when he drove for ABF. 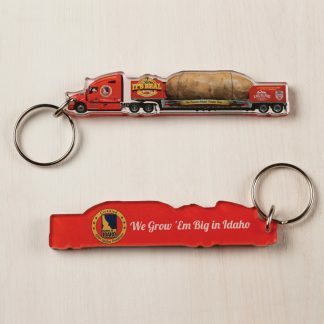 Ron is friends with the competition coordinator, Herschel Evans, and they were able to coordinate the Big Idaho Potato truck coming to this years’ competition! Fifty plus companies came together to make this event possible. It was so nice meeting members of the trucking community and to see what great work they are doing to fundraise. The Tater Twins with Safety Sammy! For the competition, truck drivers had to navigate a course and they were scored on their efficiency and accuracy. The driver with the highest score would win the coveted first place title! Ron competed in the retired division and did an excellent job navigating the tricky course! Tater Twin Kaylee also competed in the “Better Half” divisions where women without CDL’s were able to drive the course! It was really a great event to watch and I was impressed by the driver’s skills and precision! Overall the Safety Drive for a Cure competition raised $42,000+ for the Pediatric Brain Tumor Foundation! They raised money in various ways such as competition fees, online donations, silent auction and a raffle! They also had the Rubber Duck Truck there from the movie “Convoy” drivers donated extra to drive the truck around on the course! Drivers also donated money to drive The Big Idaho Potato truck around the course! We were able to raise 300 dollars from drivers donated to drive our spud around the course! We also had a Big Helping signature board and raised money for the children! Presenting the signature Board for the Pediatric Brain Tumor Foundation! The team was honored to be a part of such a great event! It is always so nice to see communities come together for a cause! The Tater Team is heading to Natchez, Mississippi for an event at the Natchez Market on Wednesday. Then they will be heading to Lufkin, Texas for an event at the Spud Too restaurant! Thanks so much for reading! 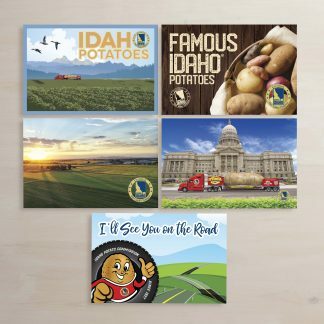 Make sure to follow our adventure on Instagram, Facebook, and Twitter at Big Idaho Potato! 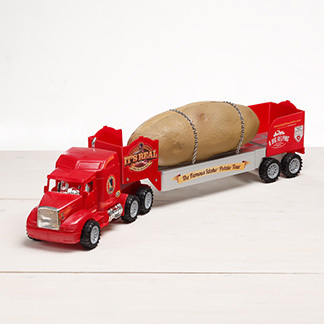 PrevPreviousWhat’s more Irish than a 4-Ton Spud?